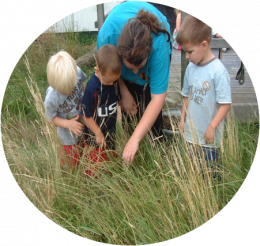 Outdoor play is an important part of learning and development and encourages children to practice and master their emerging physical skills. One of our unique features is the large outdoor area, which provides the children with endless opportunities to fully explore their natural surroundings. 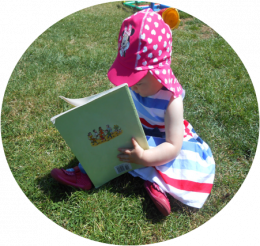 Our secure environment is shared by all of our babies and children where they gain a variety of learning opportunities, promoting each child’s individuality. Children love to go outside in all weathers and rainy and snowy days are enjoyed with wellies and all in one suits. 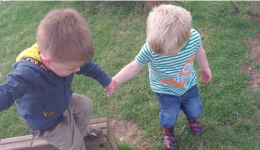 Children are provided with safe and wide boundaries outdoors where they are physically active and learn to take risks, bringing huge benefits for their confidence, self-esteem and fitness levels. 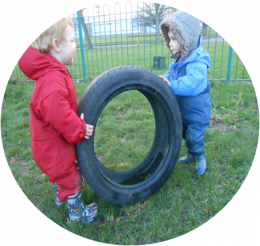 A large grassed area to play group games, or build using recycled items such as tyres, crates and wooden planks.